I was born and raised in Mexico City and have a bachelors degree in Communications from Universidad Anahuac. I have exhibited my paintings in the U.S.A. in over 30 groups shows including several Galleries in Manhattan, Brooklyn, Long Island, Poughkeepsie, California, and Philadelphia as well as in Sotheby's Auction House in NY and various museums like the Attleboro Arts Museum in Massachusetts and the New Britain Museum of America Art. I had one Solo Show in NYC and have participated in more than five group shows in Mexico City and Puebla, Mexico. I have also been teaching young girls?? ?from middle school to high school?? ?with drawing in a private setting. In 2015, I received "The Award of Excellence" from Huntington Arts Council. In 2017, I was given an "Honorable Mention Award" by the Barrett Art Center at the Circle Foundation for the Arts as well as the prize for second place at the Brooklyn Waterfront Artists Coalition. In 2018, I was given "The Passion Project Award" and "Artdex Award." I am a member of the American Federation of the Arts and most Museums in New York. 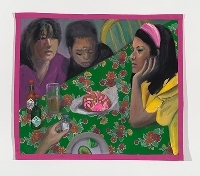 Jessica Alazraki's figurative portraits convey everyday stories of colorful characters. 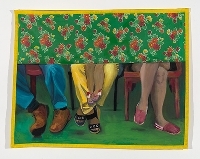 These are confronting the viewer, without interacting with each other, instead submerged in their own personal psyche. 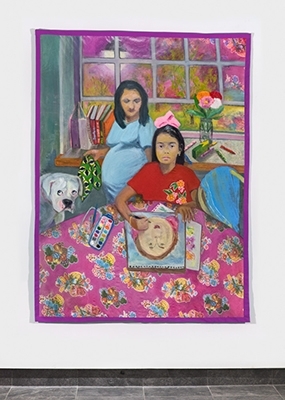 The narratives are based on ordinary and familiar scenes of Latino family life, highlighting the influence of American culture and implying indirect political statements. The strong presence of primitive and na? ?ve style connects the works to folklore elements and Mexican crafts.